Traveling with liquids can be messy. It’s an extra hassle when you’re going through airport security and it’s a recipe for disaster when a bottle of shampoo opens in your gym bag. Lucky for us, humangear is on the case. GoToobs are approved for airplane carry-ons, safe for food, and BPA-free. Besides being functional, GoToobs look chic with their smooth profile and lovely hues. They’re an important addition to the toiletry bag or carry-on luggage. 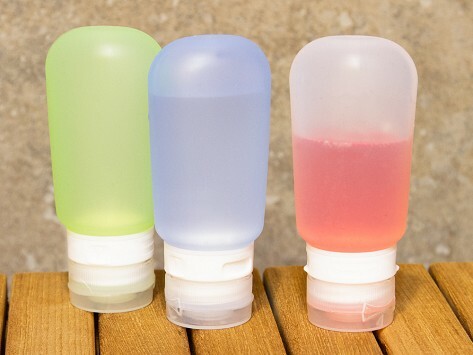 Plus, you won’t have to worry about mystery contents in unmarked bottles anymore. Dimensions: Small: 8" x 2" x 5.5"; Large: 9" x 2" x 6.75"
Weight: Small: 0.32 lb. ; Large: 0.46 lb.